Does your Facebook fan page have thousands of fans? Do you have tens of thousands of Twitter followers? Do your YouTube videos go viral? That’s great for you…but what about your bottom line? In the current social media-obsessed environment, many people mistake social media follower count as a sign of a successful social media campaign. Consider the sad story of a friend of mine. A few weeks ago he called me panicked because Facebook disabled his company’s fan page. He had 7,000 fans. And that’s all he had. He wanted me to help him convince Facebook to restore his page and give him access to his 7,000 fans. I had to tell him the bad news: Facebook owns all that information, and they don’t owe you anything. My friend had become a digital sharecropper, and suffered the negative consequences of not owning his customer list. According to Brian Massey, “The Conversion Scientist,” the best social media strategy for this is a content-oriented approach instead of a conversation-oriented approach. Unlike conversation-oriented strategies, (the content-oriented) approach focuses on content as we’ve defined it here: communication that is designed to educate, entertain or inform. This strategy is ideal for lead generation, thought-leadership and building targeted social channels. (Brian Massey: The Perfect Social Media Measurement Plan). After you develop content in the form of blog posts and articles, share it through your preferred social media channels. However, you must add one very important element to each piece of content you share: a link to a social media landing page. 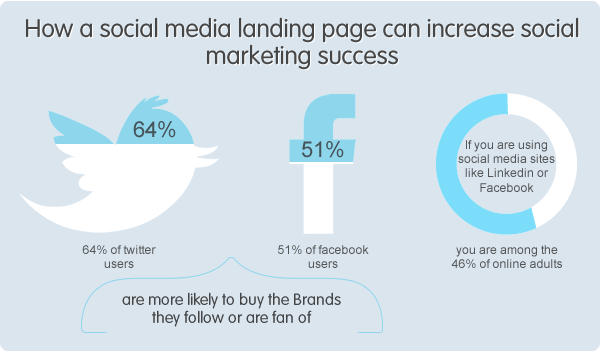 A social media landing page is the key to getting people from your social networks and into your commerce network. A commerce network is any path that leads online visitors into a commercial relationship with you, whether it’s a subscription to your email newsletter (or autoresponder) or a direct purchase of a product. Getting people off of your social networks and into your own commerce network is the secret to social media success: you’re taking them off property you don’t own, and bringing them into your own place of business. Our new Lander landing page platform makes this easy. Click here to find out more about how easy it is to set up a social media landing page so you can convert fans, followers and connections into customers! Co-Founder at “Somosloulou” and Founder at “t_creu”. She is a specialist in the fashion industry and technology.